If you have ever had to clean a home that has Mexican Brick as its exterior siding, you know it can be very challenging to clean in a safe and efficient manner. Mexican Brick is very soft and brittle, not to mention - very porous, so you need to be very careful not to damage it when you try to remove anything from it with traditional pressure washing equipment and chemicals. When cleaning this type of brick one must be very careful and not apply too much pressure. If too much pressure is applied, the brick can literally break in half and disintegrate into dust. 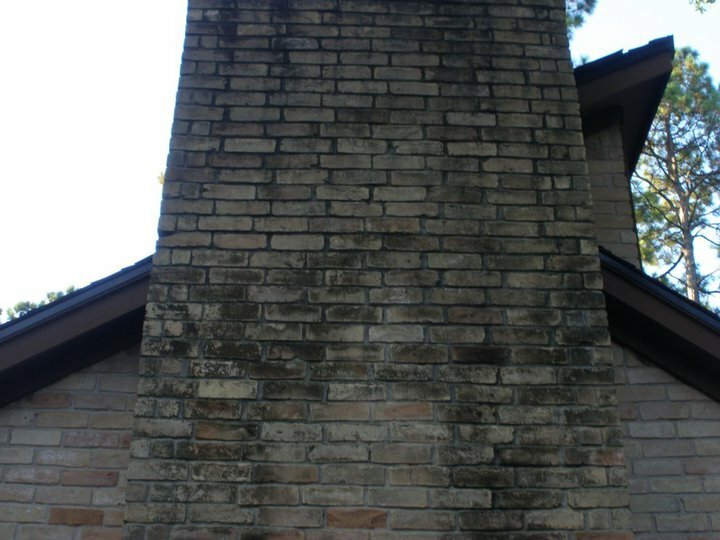 To get Mexican Brick completely clean you must use a non-hazardous, safe solution that can get into the pores of the brick to REMOVE the mold and mildew completely without damaging the surface or trhe integrity of the brick. If possible, you want to deep clean the surface and, if possible, to prevent future mold growth. Most traditional mold & mildew removing chemicals contain toxins or dangerous additives and they only clean the surface mold and mildew at the 'moment of contact'. This leaves tiny spores behind in the pores of the brick that will just begin growing again immediately once the moisture builds up to the right level. 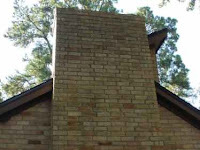 EATOILS™' local distributor in Porter, Texas, Clean and Green Solutions LLC, deals with Mexican Brick on a daily basis. Recently, they were called out to this home (see Before picture above) to clean all the mold and mildew from the brick. The homeowner had received complaint letters from the local neighborhood homeowners association and he needed to get the home cleaned in order to be in compliance with the association guidelines. Here is how they did it: Using the EATOILS™ BT200™ Certified GREEN degreaser they mixed the product at 5 ounces of EATOILS™ BT200™ to one gallon of water. Using an X-JET applicator, they applied the diluted EATOILS™ BT200™ to the entire surface of all walls and allowed it to sit for 10 minutes. Then they repeated the application and allowed to it to sit for an additional 20 minutes. They used a total of five gallons of diluted solution, which required 25 ounces of EATOILS™ BT200™. An X-JET applicator is a nozzle for a Pressure Washer that allows the product to be applied directly to the surface with out being diluted any further. Even though the EATOILS™ BT200™ is a degreaser, it is an excellent product for removing mold and mildew on contact, plus it also can prevent the re-infestation of the mold. After allowing the EATOILS™ BT200™ to dwell for the times stated, they then used the pressure washer (3500PSI/6 GPM) to remove the mold and mildew stains. However, they used the chemical tip. The chemical tip is normally used to apply solution or chemicals at a very low pressure. This tip actually sprays the water onto the surface with less pressure than a garden hose sprayer that is set on “jet” or “full stream”. Using this tip meant that absolutely NO high pressure was used - ANOTHER AMAZING REASON TO USE EATOILS™ BT200™! As you can see in the pictures above (Before and After), the brick cleaned up perfectly with no damage to the brick whatsoever. Once all areas were cleaned they re-applied the EATOILS™ BT200™ and left it to dry with NO RINSING. This will provide continuing, ongoing cleaning and mold prevention to help to keep the brick cleaner for a longer period of time. EATOILS™ BT200™ is a Super Concentrated Certified GREEN degreaser and all purpose cleaner. Once diluted at 5 ounces per gallon, our end user product cost was less than $5.00. Compared to the cost of other products that require dangerous chemicals to do the cleaning, and can damage the surface, EATOILS™ BT200™ stands alone as the best and safest cleaner - yet it remains one of the most economical available on the market today. EATOILS™ BT200™ degreaser can also be used to remove oil and other automotive stains from equipment, concrete, asphalt and soil. It also a great cleaner for canvas and fabric sunshades, umbrellas, tents, etc. EATOILS™ BT200™ will also remove grease, tar, and oil, from clothing, drapes, carpeting, upholstery and just about any other surface. Plus, it is environmentally friendly - and completely safe for you and your family. How about ordering some today? Click here.